Self-love is perhaps one of the most fundamental yet misunderstood concepts in the world right now. Some dismiss it as a new age ideology that cannot be applied in practical terms. But nothing could be further from the truth. 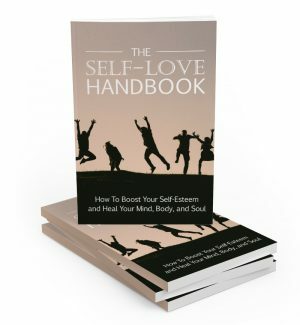 This eBook will show you practical steps with regard to developing self-love. It will also explain what it is and outline the history of the trait and how it has been a core foundation of all spiritual teachings. way that a confident person walks or observe their traits. But fundamentally, all radical change begins from within. You then start to really value yourself as a powerful creator of your own reality and deserving of love and respect from everybody. Selflove is the opposite of selfish. You cannot love another person unconditionally unless you love yourself first. Self-love is not about engaging in destructive patterns of behavior and turning a blind eye. It has nothing to do with arrogance or narcissism and everything to do with becoming a fully whole and integrated individual. When you are able to exercise self-love, your life will become so much easier. This is because you will not sabotage yourself as much, which is what everybody does with their beliefs about unworthiness. You will also have much more stability in your life as you will no longer depend on others for fulfillment. Your emotions and reactions will not be volatile and you will actually become detached (but not uncaring) from a lot of stuff that goes on in the world. “In the end, only three things matter: how much you loved, how gently you lived, and how gracefully you let go of things not meant for you” Your ability to love yourself and others is all that really matters. How to get there is another matter entirely. For this, you have to find out who you are and love yourself unconditionally. Finding the self is a mystical concept that has been around since ancient times. The ‘self’ has been described by many names, such as the soul, the oversoul, the atman, the monad, the “I AM” presence, the Christos, the illumined one, and so on. Labels aside, it can be described as who you truly are without any of the social behaviors and attitudes that you have downloaded since birth. It can be ‘found’ by shedding illusion and peeling away the layers of programming, which can also be called the ego. The entire process of childhood and socialization is essentially learning how to forget who we really are. Our peers and parents scold us when we do something that does not conform to their viewpoint. As such, we learn how to behave in such a way that we can be accepted. Being part of a group, family or tribe is the single most important social norm. This dates back to a time where non-conformity would have gotten us thrown out of the tribe - likely to starve or freeze to death. Pleasing others is ingrained deep within us, but it is also very harmful in terms of spiritual evolution. So when born, we experience traumas in forgetting who we are. And we then have to go through the process of forgetting everything we learned in school and through wider society to find our true selves. Sadly, reconnecting is anything but easy in the modern age. Technology ensures that information is everywhere so we will look everywhere but inside - where the self resides. 4. The ability to leave behind all technology and distractions. In many ways, it is simple and straightforward. Get to a silent location and meditate on loving the self. Restrict your diet so you are not eating any meat, processed food, caffeine, or alcohol. Avoid technology and eliminate all mental, physical, and emotional distractions. Though this can be difficult to do, the results will be immense. It is the ideal healing modality. 3 - 7 days is enough for significant changes to occur with the above protocol. It can be repeated as often as necessary and while you won’t succeed the first or even the tenth time, it is enough to fully rejuvenate you from the stresses of modern living in a big way. Ironically, the quickest way to find the self is to do absolutely nothing at all. Your body, mind, and soul will heal if you just stop eating, thinking, and reading garbage material all the time. You will be in a perfect state of health if you stop doing things that put you in a depressed mood and environment. The grand irony of it all is that people feel to need to ‘do something’ to fix an illusory problem. This leads to fad diets, liposuction, gender changes, unhappy relationships, and unaffordable mortgages. Vedic philosophy has by no means a stranglehold on silent retreats and fasting. But it really cuts to the heart of the matter with its emphasis on these things and its constant focus on finding the self. There are hundreds of other esoteric modalities such as crystal bowls, visualization, spinning, manifestation, lucid dreaming, chakra work and many more. While they might bring many benefits and even some paranormal effects, they do not cut to the core of finding the self. This involves letting go of everything you have learned to step into new dimensions. The pinnacle of self-esteem ultimately culminates in selfrealization, a state of being that is talked about in practically every piece of spiritual literature of note. This state goes beyond the typical human experience to full bodied bliss and understanding. However, self-realized people are still flesh and blood, live to tell their experiences, have written books, and can be found by those who actively search for them. There are more ways to try and find who you really are. It is best likened to the peeling of an onion where only the true self is left. A good place to start is to review all of what has happened to you in this lifetime and the major events. The point is not to wallow in them or take pride in achievements. Just draw a linear map of the major events that happened, what their effect on you was, and try to see the bigger picture. This will help to build a degree of objectivity. In terms of finding self, you do not want to be dependent in any way. So look at all the ways you are emotionally, mentally, physically, or financially dependent on other people and things. Become as self-sufficient as possible. This could entail an eliminating of cigarettes or bad food and finding a new job where you work for yourself. It will be different for everybody. Finding self is an individual process. Nobody has ever selfrealized themselves together. It is just not the way that the universe works. Groupthink is the antithesis of individual empowerment. Because even in groups, solutions only come from one individual with one spark of inspiration. There is no way to share creativity or ingenuity because it comes from within. This means that when you are finding the self, the practices that you use and the philosophy that you adopt will be yours alone. If you simply copy what others are doing, then you are already disempowered, and will never find the self. Without making decisions of your own volition, you are not giving yourself any power.